Baked Cod Provençal, quick, easy gourmet dinner. A dinner from the Mediterranean: Provence inspired cod, Spanish influenced orzo, olives from everywhere. 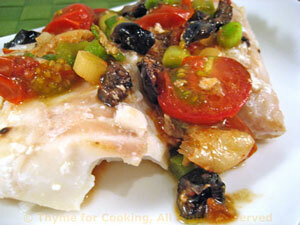 Green garlic, black olives and cherry tomatoes finish this simple, baked fish. Place fish on a baking sheet. Mix 2 tsp olive oil, 2 tsp lemon juice, drizzle on fish. Bake fish, 400F (200C) for 15 - 20 minutes, depending on thickness, until done. Fish is done when it starts to turn opaque and flakes with a fork. Trim and slice green garlic, using as much green as you can. Heat a medium skillet over medium heat. Add oil, green garlic and sauté 2 minutes. Add olives, tomatoes, thyme and heat through. The tomatoes should just start to soften. Spoon over fish and serve. 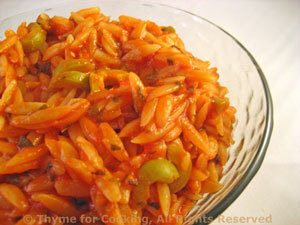 Orzo is a versatile rice shaped pasta that is delicious when cooked right in the sauce. It absorbs the flavors but stays moist. It's perfect as a base for other foods. Add stock, tomato sauce and oregano, bring to a simmer on medium heat. Turn heat to low and simmer until done, stirring occasionally, 15 - 20 minutes. All stock will be absorbed. Taste the orzo to see if it's done to your liking. If not add more liquid. 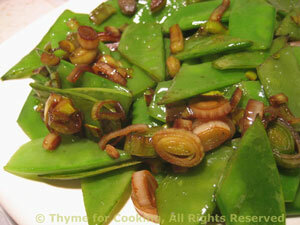 Remove from heat, stir in olives and serve. This should be creamy, not stiff.